Click here to see “New Stuff” messages. The Santa Cruz City Council has a chance to take the same pro-transit step as Boulder, Colorado, where a quarter of working people get to work by bus. METRO staff have drafted an Eco-pass proposal that would supply over 4000 workers in Downtown Santa Cruz with a bus pass, paid for by the Downtown Parking District. This program could free up more parking for customers downtown at a fraction of the cost of a new garage. 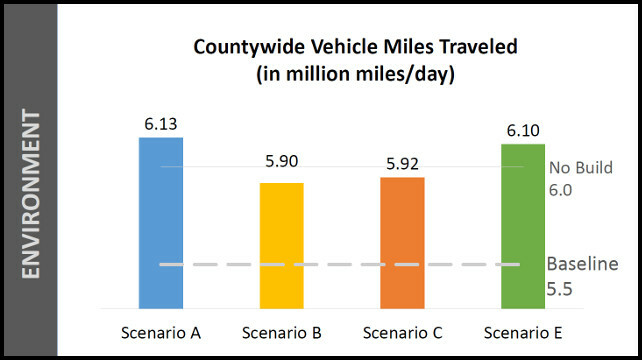 The Regional Transportation Commission intends to spend $100 million to build 4 miles of auxiliary lanes (exit-only lanes) between Santa Cruz and Aptos. 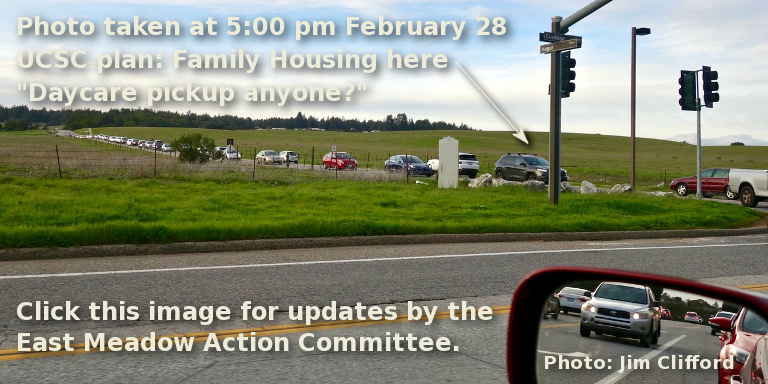 The EIR on Highway 1 projects concluded that this project would neither reduce traffic congestion nor improve safety. 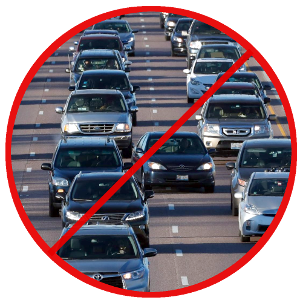 For a detailed analysis, and to find out how we can redirect funds that would be wasted on highway widening to boost our public transit infrastructure, click here. Credits: The “Post-Construction View” header image above is Figure 2.1.6-6 from the Draft EIR for the addition of auxiliary lanes to Highway 1. The subsequent image shows typical traffic congestion, and is from the Chicago Tribune, December 14, 2017. The SMART train: How's it doing? On April 24, KSRO interviewed Deborah Fudge, who is the Mayor of Windsor (a town on Highway 101, north of Santa Rosa) and now the Chair of the Board of Directors of the Sonoma-Marin Area Regional Transit (SMART) District. She had some good news. Here is an audio recording of that interview. It's a good listen—only six minutes. In the interview, Deb Fudge mentions a Bay Area ballot measure on the June 5 primary election. That measure passed—55% to 45% overall—with only two of the nine counties voting NO. Then on August 1, Farhad Mansourian, the Executive Director of SMART, gave a delightful presentation at Simpkins, bringing us all up to date on the current status. He was great, awarding prizes—baseball caps with the SMART logo—to those in the packed audience who gave correct answers to his questions. Deb Fudge was there too. She grew up in Santa Cruz, a graduate of Harbor High. Then on the following morning, Mansourian repeated his presentation at the meeting of the RTC, this time with an excellent informative slide show, called The Evolution of SMART. You can view the slides by clicking on the blue link. Farhad was keen to clarify that the main goal of providing the SMART train was not to reduce congestion on Highway 101, but to provide travel mode options for travelers. 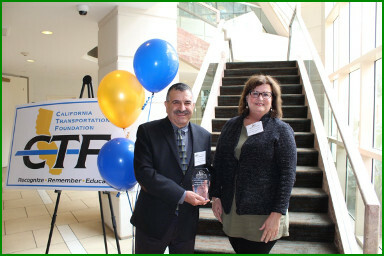 Here are Farhad and Deb, having just won an award (last May) from the California Transportation Foundation. 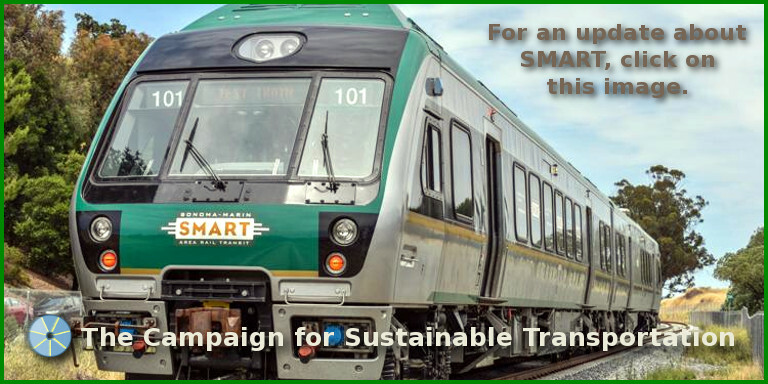 The Campaign for Sustainable Transportation supports the development of public transit on the rail corridor, alongside a beautiful bike and pedestrian trail. The corridor offers a unique opportunity for transit vehicles to operate without getting stuck in vehicle traffic. This will transform our public transit system, moving us towards our goals of environmental sustainability and social equity in transportation. We are open to considering a variety of forms of transit that may be appropriate for the corridor. In the pages on this website we have posted articles on rail transit, bus rapid transit, and various forms of automated transit. To read more, click here, or here, or on any of the nine tabs in the “Rail Corridor” dropdown above. 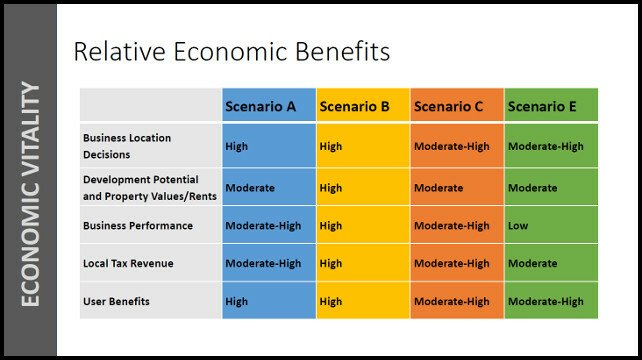 On October 8, our Regional Transportation Commission's Bicycle Advisory Committee voted unanimously to support “Scenario B” of the Unified Corridor Investment Study. This motion of support was the first action by an official body in the county to express a preference for a Scenario of the Study at this “Step 2” phase. The motion that was voted on followed a slide presentation by RTC staff planners Ginger Dykaar and Grace Blakeslee. The motion stressed projects of particular interest to bicyclists. 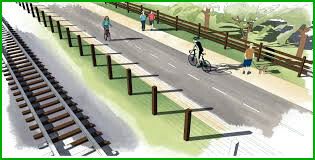 Such projects included “buffered or protected bike lanes”, “intersection improvements for bikes and pedestrians” and the “bikes and pedestrian trail in the rail corridor”. The motion also highlighted “local rail transit with interregional connections”. Below are three of the slides from the presentation that seemed especially relevant. 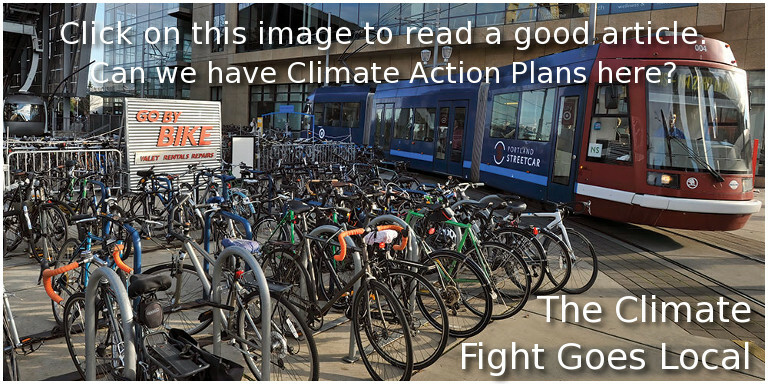 We have uploaded “The Climate Fight Goes Local”, an article from the American Planning Association that just appeared in their Planning magazine of April 2019. It's worth a read, and we can take action. Click here to read it. If you missed Mark Lakeman's presentation on March 29, we still have the video of a TEDx talk he gave here in Santa Cruz in 2014. It is here, and worth watching. 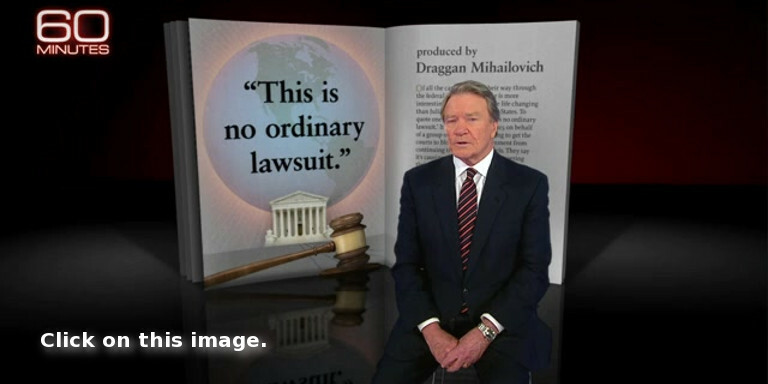 We have posted a new 13-minute video about a lawsuit: “Juliana v. United States”. This is no ordinary lawsuit. The video is from 60 minutes. Click here to watch it. If you watch it, it will warm your heart. 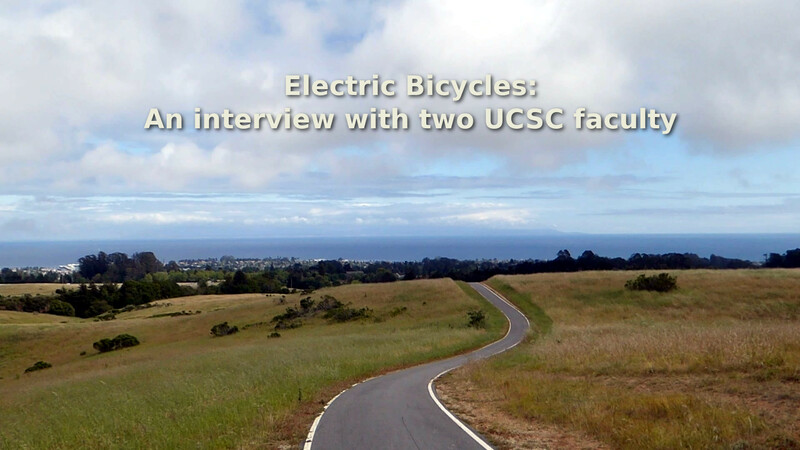 We also have a new header image of Hagar & Coolidge on the UCSC campus. There are too many cars. Click here, or here to help the East Meadow Action Committee prevent the construction of new housing on the East Meadow. We have posted a new short video, with Adam Millard-Ball talking about “Parking” of self-driving cars. Click here to watch it. We have updated our Links menu tab in the navigation bar above. Now included is a post of Len Beyea's essay on New Urbanism. Click on the link here or on the link in the Links menu to read it. A direct link to the article is also here,where you may listen to it being read aloud. 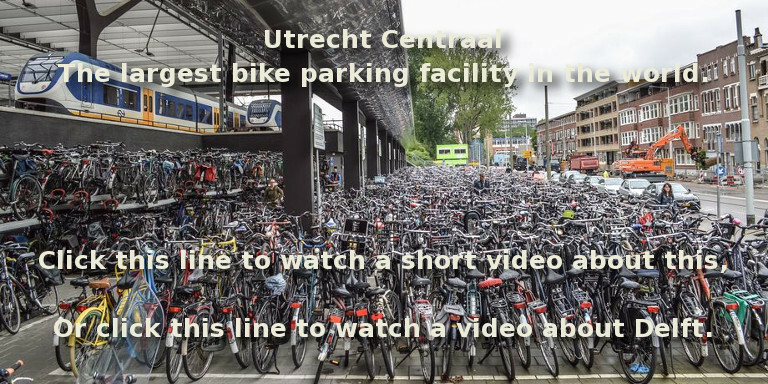 Here are three links to short videos about new bike parking facilities in the Netherlands: Utrecht Centraal is the largest bike parking facility in the world. Delft Central Station is also large, with spaces for several thousand bicycles. And if you want some good laughs along with information, try this one. It's also about the Delft Station. Links to the first two are also available from the third header image of this home page. 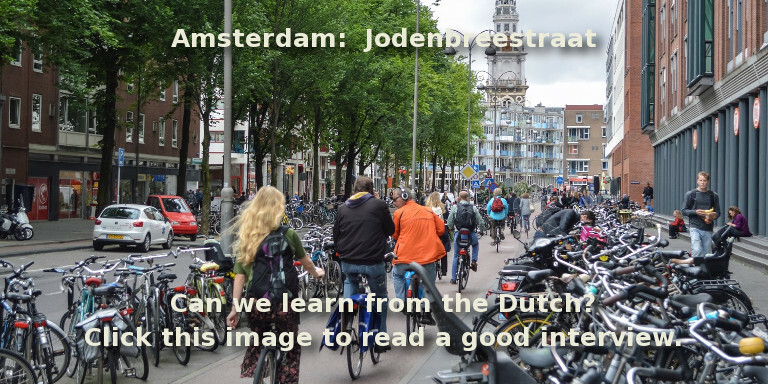 Bike culture is rampant in the Netherlands. 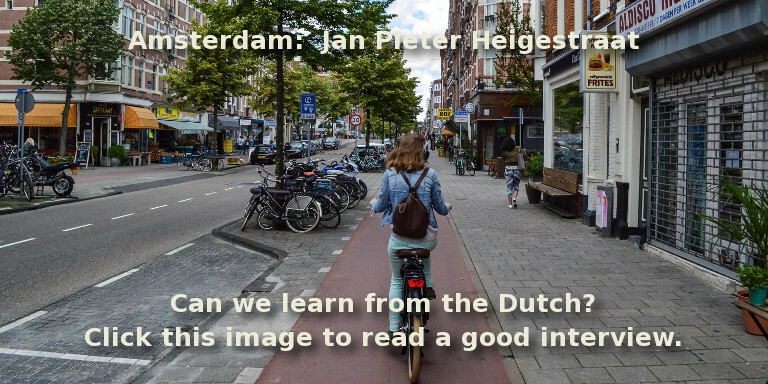 Can we learn from the Dutch? Click here to read a good interview. Thank you for helping defeat Proposition 6. We can breath a sigh of relief. The 17X_caltrain timetable has been updated to reflect the minor 17X schedule changes made September 6, 2018. 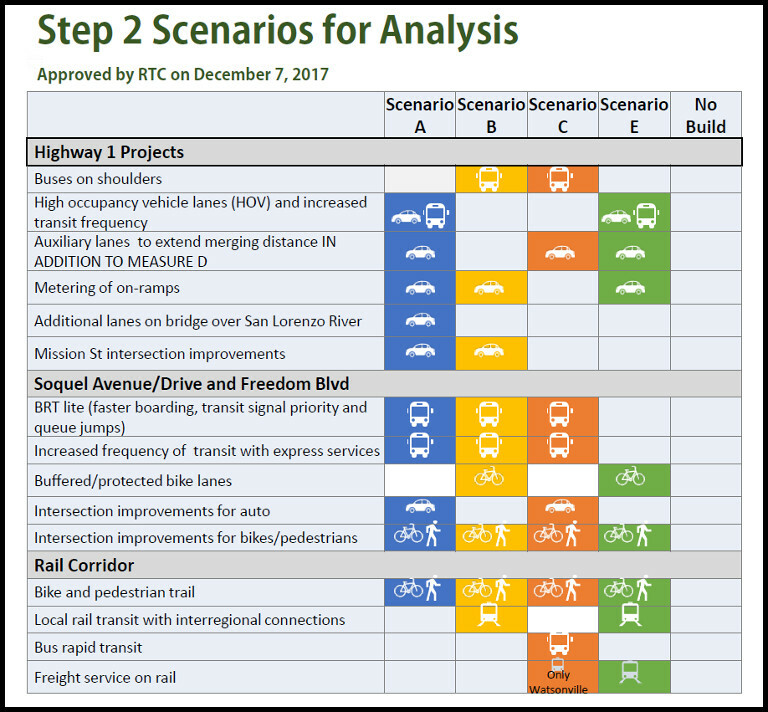 On October 8, 2018 the RTC's Bike Committee voted unanimously to support Scenario B of the Unified Corridor Investment Study. Click here for the details. A Video of the Candidates Forum: Click hereto see how City Council candidates responded to each of six questions we asked of them at the Candidates Forum on September 18. We updated this page on October 9 to add information on the Garage/Library project. See where each of the candidates stand on this issue. 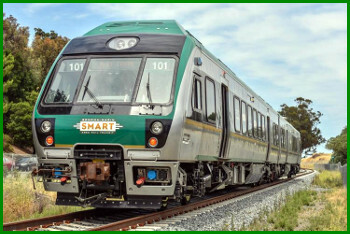 The SMART train: How's it doing? There is lots of good news from the Sonoma-Marin Area Regional Transit District. Just click here to read the details. A new slide show: Bruce Sawhill has contributed a new slide show, entitled “A Vision for Rail in Santa Cruz County”. To view it, click here. There is also an addendum about decibels and how quiet our trains could be, which is here. Read Lewis Mumford's essay: “The Highway and the City”. To find out more, click here. Your homework is to read it!! We recently updated this page. This nine-page essay is our guiding document. It's more relevant today than when it was written—sixty years ago! Working Group Meetings: The Campaign for Sustainable Transportation meets on the 2nd and 4th Wednesdays of the month at 12:30pm. 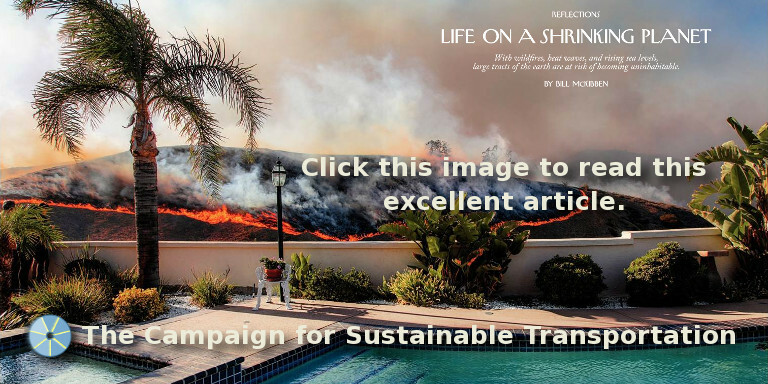 Contact Rick Longinotti for location: "Rick [at] SustainableTransportationSC [dot] org". An Updated 17X_caltrain timetable is now available. It reflects changes by METRO to accommodate the generally slower beach traffic on Highway 17. Click here to see it. 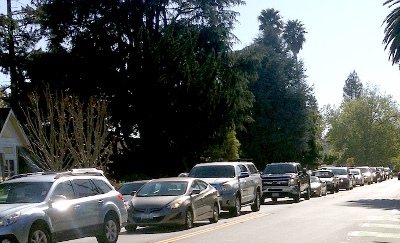 About the image: Traffic on King Street at 4:40pm jams up, waiting for the signal light at Mission Street. A video of our May 23 event is now available. Click here to watch it. 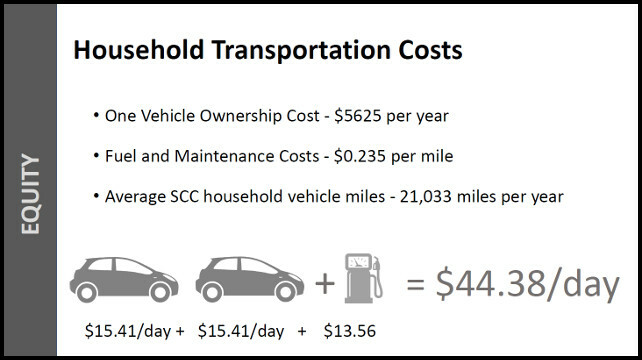 If Stanford has achieved zero increase in peak period vehicle trips to campus since 2001, UCSC can do the same. Rick Longinotti, Co-chair of Campaign for Sustainable Transportation, describes the strategies to keep traffic from getting worse and what we need to do to advocate for them. Please sign our new petition, urging our Santa Cruz City Council to accept the plan developed by METRO staff to offer free bus passes to all workers in Downtown Santa Cruz. A link to this new petition is here. Read what Santa Cruz downtown business owners have to say about the plan to build a new five-level garage (with a new library on the ground floor). The link to this new page is here. We have upgraded our presentation of videos by the renowned planner and architect Peter Calthorpe. Calthorpe describes key decisions that have resulted in livable and safe communities, and in reduced vehicle miles traveled per household. His primary example is Portland, Oregon. The three videos are short, and relevant for our times and our community. Have a look at them. They are excellent. Just click on this link. We have posted two opinion pieces—one by Paul Schoellhamer that appeared in the Sentinel, and the other by George Dondero that appeared in the Aptos Times, the Scotts Valley Times and the Capitola Times—explaining why tearing up the tracks is a bad idea. To read them, click here. Top 10 Reasons to Build the Rail Trail. A new video created by Friends of the Rail & Trail and the Land Trust of Santa Cruz County and sponsored by seven other Santa Cruz County organizations, it's a good one, and at only a minute and 19 seconds, easy to view. Click here to watch it. Please consider making a donation to help us pay for our website charges, which are very reasonable. Just click here, or on the green donate button above to learn how to do it. We have a new page of songs, which is right here. We would welcome additional songs, if you would like to contribute any. Just write to us here if you would like to. We have a page of Stories by Bus Riders! Put together by Dana Bagshaw, it is right here. These are folks who enjoy using the bus to get around, and on this page, they tell you why. Be sure to write to us (click here) if you have any comments or suggestions or if something about this website does not work for you.